Adequate Steel have been supplying complete supermarket racking solutions that offer end to end solutions in supermarket racking systems. With a comprehensive range of racking solutions, accessories and equipments, Adequate Steel can easily canter to any merchandising needs. 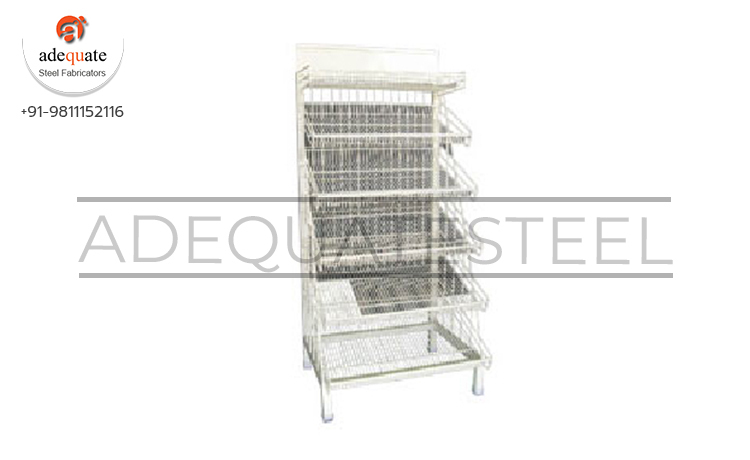 Some of the popular elegantly styled fittings and add-ons to the superior quality construction and design are supermarket impulse racks, supermarket alligator bins, supermarket perforated peg boards, supermarket ball cage racks, supermarket stall bins and supermarket broom stands. Supermarket impulse racks from Adequate Steel are offered in a standard modular dimension that is apt to suit any retail environment. True to its name, impulse racks offer best suited to tempt customers to make impulsive purchases and most often than not, these can be seen near to the billing and supermarket cash counters. Useful products that can be handy for day to use are displayed in these racks and unsurprisingly customers will be tempted to purchase them while queuing up for the cash counters.